The daughter of an enslaved seamstress and a white indentured servant, Ona Maria Judge (ca. 1773–February 25, 1848) was a trusted personal maid to Martha Washington. She grew up at Mount Vernon, likely living in the communal slave quarters known as the House for Families with her mother and siblings. 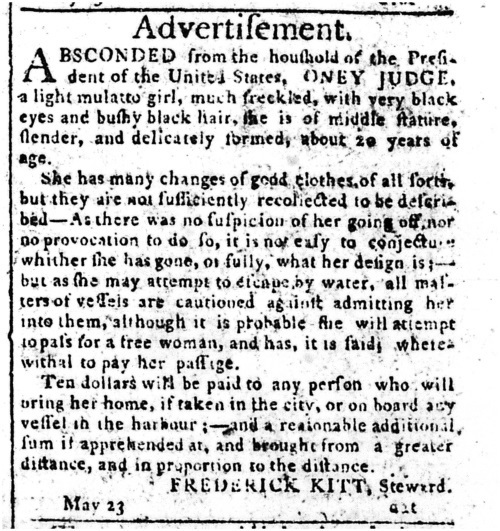 Like most enslaved women and men, she was not taught how to read or write, although she was trained as a seamstress. She began working as part of the labor force in the mansion as a child and became a favorite of Martha Washington, who selected Judge as one of the few slaves to accompany her to New York and then to Philadelphia during George Washington's presidential terms. While living in Philadelphia, Judge (who was referred to by the Washingtons as Oney) was regularly sent home to Mount Vernon to avoid establishing legal residency in Pennsylvania that would result in her freedom. Inspired by abolitionist sentiment in Philadelphia and angry that she was to be given to the Washingtons' granddaughter, Judge turned to the city's free black community to help her escape. While the family ate dinner on May 21, 1796, Judge fled on a ship that took her to Portsmouth, New Hampshire. She found work as a domestic servant and married an African American sailor, with whom she had three children, and avoided being returned to slavery despite George Washington's multiple attempts to regain his wife's property. For more than fifty years, Ona Judge Staines succeeded in living as a free woman. “Ona Judge ,” Virginia Changemakers, accessed April 21, 2019, http://edu.lva.virginia.gov/changemakers/items/show/355.